This Week’s Basket from Milk and Honey Organics Included: Red Potatoes, Yellow Onions, Jonagold Apples, Bosc Pears, Pomegranates, Roma Tomatoes, Shallots, Parisi Farms’ Broccoli Crowns, Mustard Greens and Butternut Squash. My butternut squash so was so adorable – yes, I honestly think produce can be cute. Some baskets had kiwi and lettuce, but I have plenty of lettuce because I had coupons to use from Organic Girl by the end of 2011. 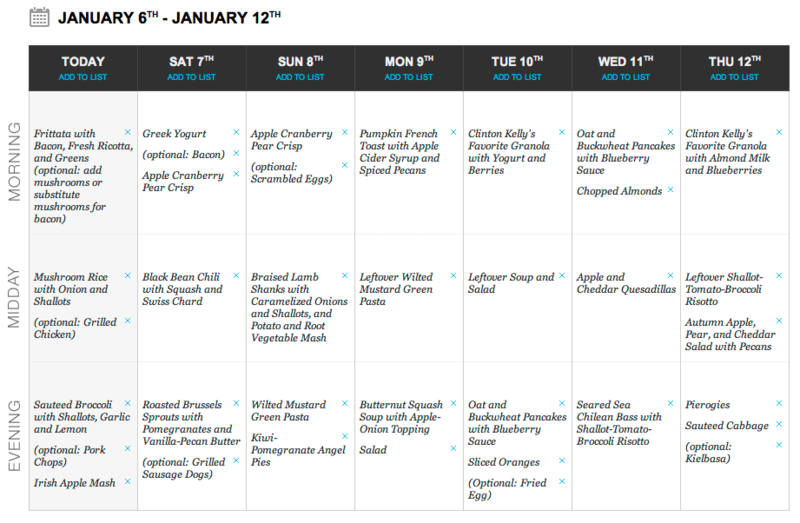 This Week’s Meal Plan: I’m eating a Whole-Food, Plant-Based Diet, with only 5% of my calories from animal protein, but I did add optional meat, egg, and cheese options for my husband. Rub potatoes with olive oil and sprinkle with sea salt. Bake 350F for 40 minutes. Meanwhile, mix together the following ingredients and set aside. Remove potatoes from oven and let rest for a few minutes (till cool enough to handle). Turn heat up to 400F. Cut each potato in half lengthwise, scoop out middle, leaving 1/8″ to 1/4″ rim around potato. Add potato middles to the cheese mixture. Mash and spoon into potato shells. Bake at 400F for 15 more minutes, until golden brown. Top with 1 Tbsp. finely chopped fresh parsley leaves. Serve warm! Wednesday nights are usually a little hectic for us. Every other week is Shepherding Group (a small community within our church that meets together to care and share in a more intimate setting than corporate worship). The alternate weeks, as often as we can make it, are prayer meetings at church. I usually get home around 5:30pm and we have to be out the door by 6:40pm or so if we want to make sure to get there on time. That doesn’t leave much time for dinner. This week, I got off a little early and we came home and used the majority of our leftover vegetables from our weekly produce basket for a vegetarian quick fix. His: EarthFare's Roasted Potatoes (yum! ), Sauteed Cabbage (butter, salt & pepper), and sauteed medley (broccolini, carrots, green beans, garlic, butter, salt & pepper). Hers: potatoes and sauteed medley (same as His), and Sauteed Celery (with shallots, garlic, mushroom, butter, thyme, bay leaf, salt and pepper). I had half of my plate (and a little of Bryan’s) leftover and boxed it up for lunch today. I combined the celery mixture with the vegetable medley and the flavors melded nicely. Bryan liked his dinner so much that he even said, “That was a really great dinner,” three hours later, on our way home from church! Oh, and, by the way, we were still full and satisfied after church too! Those potatoes definitely stick with you! Yum! Everyday Organic is a restaurant that has been open for about 5 months near the Cherrydale Cinema, here in Greenville, SC. Almost all of their menu items can be customized for vegetarians and vegans too, which I love! Bryan and I tried it out on Friday for a late lunch date and found it so quaint and enjoyable! The prices are reasonable, especially for organic cuisine! We got out for about $10 per person. Bryan had the Turkey Pesto Wrap with the Pesto Pasta Salad. He loved the sandwich, and though the pasta salad would’ve been better warm, but it was still very good. I had the Mediterranean Roasted Vegetable Dip. It came with pita triangles. The waitress talked me into the large portion, but I definitely only needed the small portion. We ended up taking over half of the dip home. I think it will taste better as a spread on a wrap than just a dip for pita chips, but it was good. I think it had sweet potato in it, which I wasn’t used to. I told my friend Amanda about the restaurant, and she took her family on Saturday for lunch. Even the kids liked it! They had the pimento spread, chicken salad, and hummus sandwich with the quinoa salad, and said they were all very good! None of us had room to try their desserts, but they certainly did look and smell tempting. AND they had a cute little organic produce section by the front door. We will definitely be going back! Another coworker, Chad, and his wife went on Saturday as well. He recommended the Cherrydale Turkey wrap with green apples and goat cheese, as well as the blueberry pie and coconut cream cheese cupcake. They’re open from 11AM-2:30PM for lunch, and then they reopen from 5-9PM for dinner. Closed on Sundays. Lunch is a full menu of soups, salads, sandwiches, etc. Lunch menu here. For dinner, they feature two menu items each night, so check the menu before you go. Dinner menu here. Check it out! We’ve been eating out less and less for two different reasons: 1. Budget concerns, and 2. The more research I do about processed foods and chemical additives, the less I want to eat out. But with Everyday Organic, we know that the prices are reasonable and that we can enjoy it guilt-free because it’s all good for us! Definitely a new favorite! I just wish there were more restaurants like this one! Today wasn’t so hard to be meatless. I enjoyed everything I ate!